My husband is big on tradition. Every month is marked by specific annual family adventures. I used to mock him for this, but now I just go with it. Actually, I do more than that. I embrace it. It’s unique traditions that make families tick. Plus having something to look forward to keeps things interesting. So now we’ve added a new annual outing to our activity roster for May and August. It’s something I wish we’d done years ago. I have no idea why it’s taken us until now to discover Centreville. I mean, it’s practically right in our backyard. 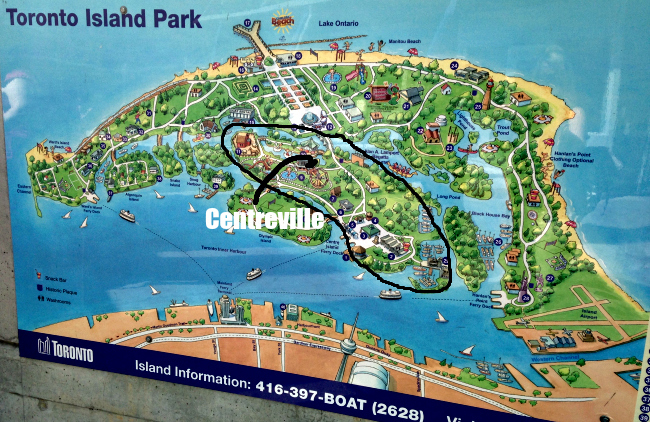 If you live in the GTA, you know about Centreville Amusement Park—nestled right in the centre of Toronto Island Park. If you’ve never been, you must put it on your “To Do” list for this summer. One reason for not yet visiting Centreville is my false assumption that getting there is difficult. Getting there is actually very simple—it’s a 15 minute ferry ride which turned out to be one of the most enjoyable parts of our adventure. 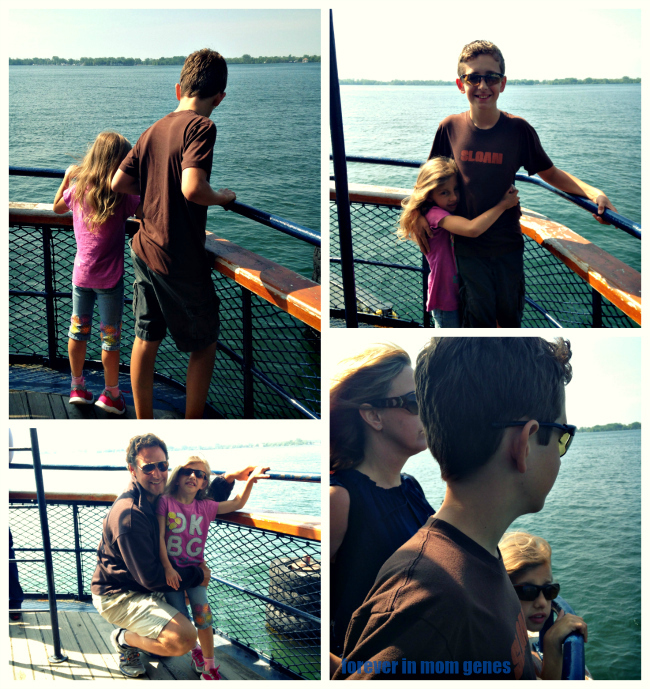 The kids were so excited about their first ferry ride. I loved watching them experience this iconic voyage for the first time. 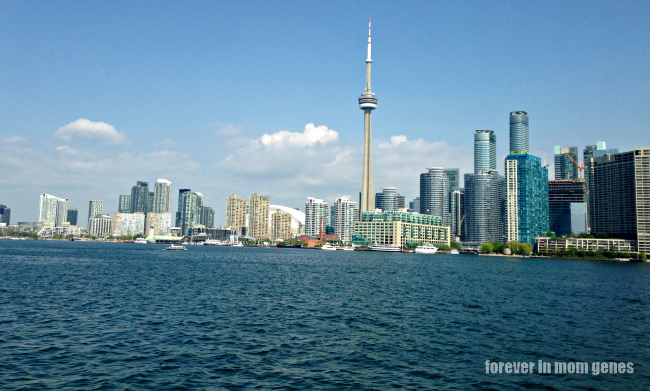 There is just something about looking back at your city from the open water. Please Note: Ferry rides may cause you to hum Chris de Burgh’s “Don’t pay the ferryman” forever, but it’s totally worth it. P.S. We happily paid the ferry(wo)man. It wasn’t expensive. Next time we plan to bring our bikes over (you can do so at no extra charge) so we can ride around the island—hello, flat terrain is an easily winded woman’s best friend. I had also assumed Centreville was more suited to families with very young children. Wrong again. Our son is twelve and he said, and I quote, “I love it here. Why haven’t we been before?? 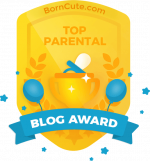 (mom guilt) It has such a great atmosphere. I can’t wait to come back.” He’s a nature lover and animal enthusiast so this idyllic island setting was a natural fit. So it seems Centreville is well suited for our whole family—hence the new annual tradition addition. Here are a few of the things we discovered about Centreville. Entrance into the park is absolutely FREE! Come and go as you please and enjoy this quaint amusement park all day long. You can buy all day ride passes and enjoy unlimited rides or buy individual tickets for your favourites. Tip: Purchase ride passes online in advance of your visit to skip the line and to save. There are rides to suit everyone from the toddler to the thrill seeker. Don’t miss the Scrambler—the fast paced ride you remember from your youth, but with a twist—it operates inside a rustic building. Once the ride hits full speed, the lights go off, the music blasts and it’s a sensational sensory good time. It’s too bad my husband skipped this one. (He claims his back was hurting, but I suspect he was sneaking a funnel cake.) Another favourite, and new to Centreville this year, is The Toronto Island Mine Coaster—perfect for new riders, but with enough kick for seasoned riders like these two. Both kids loved the classic teacup ride. How can you not love the teacup? Unless you’ve developed “adult onset spinning aversion” which basically means old ladies like me should stick to drinking tea, rather than spinning around in teacups. Fortunately there are lots of non-spinny rides. 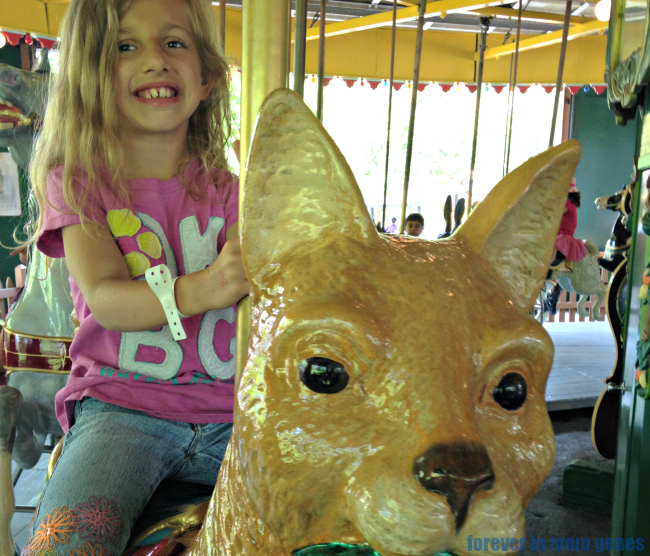 Avery mounted an orange cat on the spinny, but in a non-vomity way, Merry-Go-Round exclaiming, “I’m riding Kevin! !” FYI—Kevin is the name of our cat. The highlight for all of us was the Bumper Boats. Fun obviously, but the best part was that our special kiddo, was able to captain a boat solo. The thought crossed our minds that maybe this wasn’t a good idea. But we let Avery try and she did it and she/we couldn’t have been more proud. This ride turned out to be something all four of us could enjoy together and we can’t wait to do it again. Admission to Far Enough Farm is also FREE! This is not a petting zoo, but a picturesque farm with a variety of healthy and happy looking farm animals. The kids and I fell in love with a dapper potbelly pig who politely asked Avery for a back scratch. Then he asked Sebastian. Then Avery again. Clearly this little oinker was itching for our attention and we were happy to give it to him. We chose to eat on site since by this time of year I’m completely over making lunches. But go ahead and BYOP(icnic) if you like—you won’t be frisked for water bottles or granola bars on your way in. Brown bagging it is a budget friendly option but if you choose to eat at Centreville, there are plenty of great dining choices. Vegetarian options too. Can I get a woot for veggie dogs? I know our new piggy friend is on board with that. Seems this “always sunny” slogan is actually true. With a dismal weather forecast ahead, we managed to enjoy the entire day without a single drop of rain. In fact, it poured only minutes after we stepped off the ferry on the city side. How is this possible Centreville? 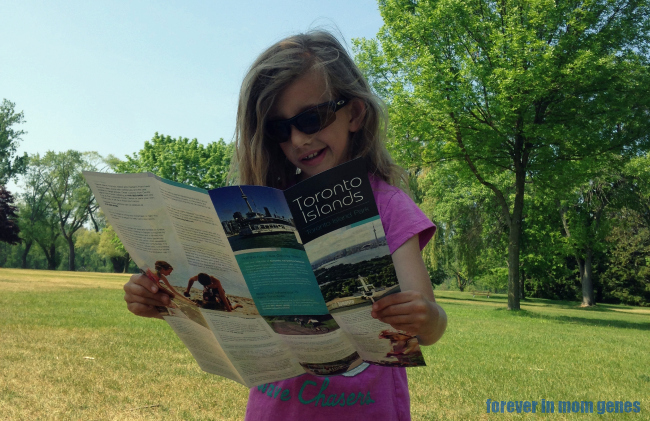 Wait, is Toronto Island in fact the island from the show LOST? Centreville is obviously magical. 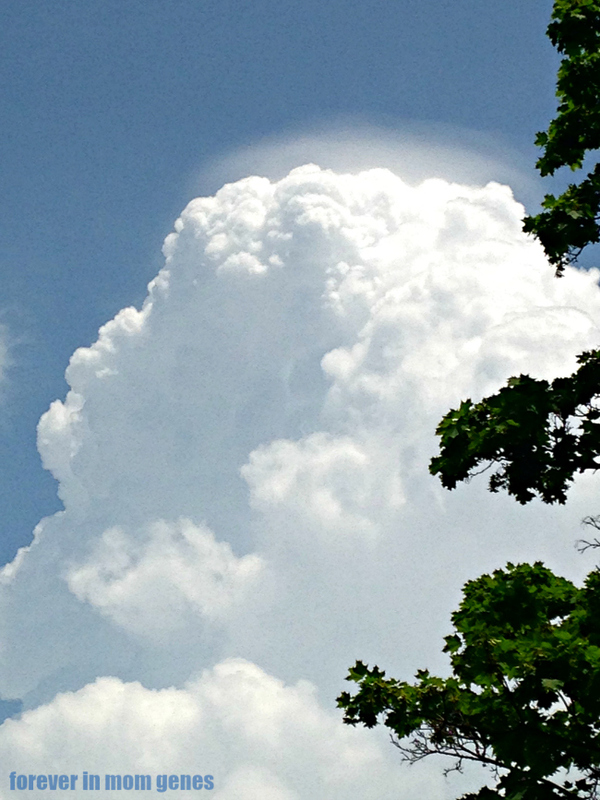 Not only can it seemingly control the weather, it also has the power to make lasting memories for families like mine. See you again in August Centreville! Centreville is open weekends in May & September and 7 days a week in June, July & August. Visit www.centreville.com for hours of operation and ticket details and say hello to @centreville4fun on Twitter & Facebook.